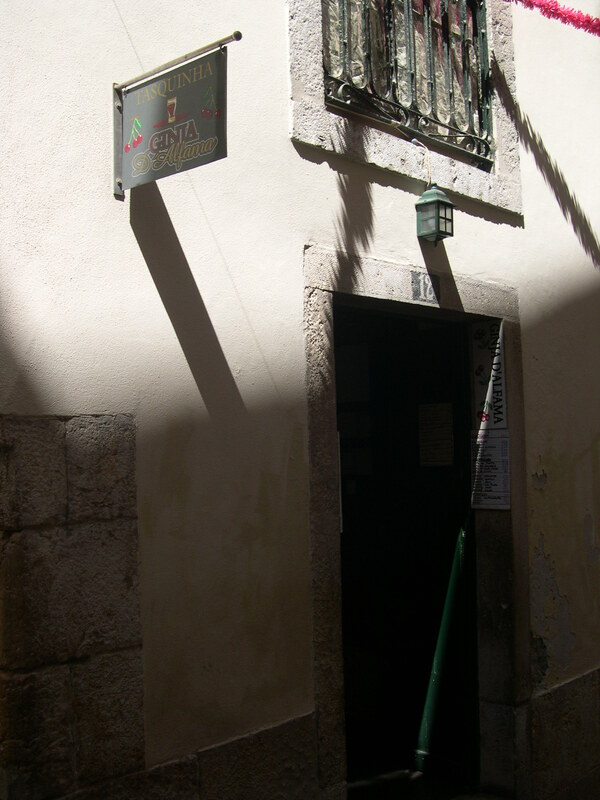 A cheap café in the Mouraria district, at the entrance to the Rua do Capelão. An assortment of herdsmen, cattle traders, merchants and prostitutes. Stage left, a small staircase leading to the guest rooms, where the Count of Marialva is lodged. A balcony stage right. At the rear a doorway with three stone steps leading to the alley. On one of the tables lies a guitar. With these lines the scene is set for the first act of Júlio Dantas’s 1901 play A Severa, the story of the Lisbon fadista Maria Severa (1820-1846) and her affair with the slumming Count of Marialva. The play, along with other books, films and songs which recount the tale of the doomed Severa, amply illustrates the blurring of myth and history that is bound up with fado history and historiography–what I occasionally refer to as ‘fadology’. The character of Severa that Dantas presented–firstly as the heroine of a novel that made its appearance just prior to its theatrical dramatization–was based on a real fadista of the mid-nineteenth century, whose affair with a count (Vimiosa, not Marialva) and whose tragic death passed into local and then national lore as the epitome of fado and the fadista’s world. From this point on Severa became a recurring figure in the cultural world of Lisbon, not least as the subject of numerous songs (some preceding, some derived from or influenced by Dantas’s play). The play itself was performed on a number of occasions throughout the twentieth century, with many notable actresses taking the part of Severa, including, in 1955, fado’s greatest star, Amália Rodrigues. A Severa was also adapted by the filmmaker Leitão de Barros in 1931 to become the first Portuguese sound film. The film, scored by Frederico de Freitas, produced a handful of songs which, through performances by Amália (‘Rua do Capelão’, ‘O Timpanas’, ‘Novo Fado da Severa’) and more recently by ‘new fadistas’ such as Dulce Pontes (‘Novo Fado da Severa’) and Lula Pena (‘Rua do Capelão’), have served to keep the story of Severa alive. The Dantas quotation above is also notable for the presence of a number of what we might call ‘fado mythemes’. I use this term to reflect the elements of fado stories–those expressed via acts of speech and song and via the written word (novel, play, lyric, history)–that, through constant repetition, come to represent, in however varied or mutated a fashion, a large part of the ‘fado-ness’ of fado (its ontology, as it were). I am thinking of these mythemes as distinct from the musical expression of fado, which comes from a particular set of instrumental and vocal styles. From Dantas’s short scene-setting paragraph we can already detect a number of mythemes. 1. The cheap café. The reference to a bohemian space and its concomitant possibility of transgression is of vital importance when considering the character of Marialva and how and why he has come to be lodging here. For the other characters present, the café provides an obvious meeting place for urban and rural types to mix with each other in a relaxed environment and to come together in appreciation of various pleasures, not least fado music. [fado’s] true home is Alfama and Mouraria, the poor quarters of the city, which flaunt their picturesque squalor on the slopes below St George’s Castle. A walk through these steep, narrow streets on a moonlit night is likely to be rewarded with the sound of a guitar and the mournful cadences of the triste canção do sul [sad song of the south]. But to hold it surely in one’s grasp it is best to go to one of the popular cafés such as the ‘Luso’ and the ‘Victoria’ where it is regularly performed by semi-professional fadistas. Gallop was writing shortly after the enforced professionalization of fado introduced by the government of António Salazar, a move that encouraged the development of venues such as O Luso that took fado away from its ‘true home’ and placed it in the more respectable bourgeois environs of the grand Avenida da Liberdade. This move was crucial in forming the split between (clandestine) amateur fado performance and its professional counterpart, with the latter becoming more or less delimited as a new song style (and therefore easier to ‘hold … surely in one’s grasp’). At the same time this move away from the Mouraria area only enhanced the romantic mythology that has sprung up around the latter’s ‘picturesque squalor’, a romanticization that would increase with the literal disappearance of much of the lower Mouraria through urban renovation projects undertaken by the Estado Novo, the name given to the ‘New State’ ushered in by Salazar in 1933. 3. The popular classes. This phrase is used here not to denote a distinct working class but to signal the plurality of ‘low others’, perhaps better understood as a lumpen proletariat, often found in romantic-mythical accounts of fado history. Fado’s origins, as most writers on the subject have been keen to make clear, were very much bound up in the experiences of the popular classes centred in the city of Lisbon. Whether born into the Lisbon underclass or newly arrived from the countryside, from nearby coastal villages or from Portugal’s colonial outposts, these people, living in the poor areas that had flourished in the shadow of the grandly designed post-earthquake city–the modern Lisbon conceived by the Marquês de Pombal in the eighteenth century–came together to form the crucible from which fado would emerge. As a mytheme–a single feature which can signify without recourse to further reduction–one would be hard pushed to better the symbolic character of the street vendor, who features in so many descriptions of fado and Lisbon life through the nineteenth and twentieth centuries. A central mytheme–or, following Roland Barthes, ‘biographeme’ –of fado’s greatest star, Amália Rodrigues, is the image of her selling fruit on the streets of Lisbon in the years immediately preceding her discovery and subsequent fame. 4. Marialvismo. This concept stems not from the fictionalized character of Dantas’s work but from the eighteenth century Marquês de Marialva, author of a treatise on horsemanship. Marialva’s son, a bullfighter whose death in the ring was famously avenged by the Marquês, was known, like Vimiosa, to frequent the bars and dark alleyways of the Mouraria district of Lisbon. Marialvismo became associated with a certain representation of masculinity that , as Miguel Vale de Almeida points out, was very much connected to processes of change within Portugal. 5. The alleyway/shadows. Alleyways in fado work, as in many modern narratives, as locations of urban secrecy. The roles of the dingy ill-lit bar and bustling public street become reversed at night-time–when so many of these stories take place–and the alleyway, plunged into shadows through its contrast with other sources of light, becomes a place of otherness. Also, like the ‘dark end of the street’ of Dan Penn’s and Chips Moman’s classic soul song, the alleyway becomes a locus for transgression, for acting out a series of relationships not possible under the symbolic scriptural (daytime) law. Added to this are a whole set of tropes regarding light and dark, public and private, safety and danger, life and death. Shadows are regularly featured in fado discourse, as evidenced by the book Fado: Vozes e Sombras and the documentary Fado: Ombre et Lumière, as well as in fado iconography (see, for example, the cover photograph of David Cohen’s book Fado Português). 6. The guitar. One of the most notable features of fado music is its use of the guitarra portuguesa, an aspect of the music that has tended to lead to a virtual synonymy between fado and guitarra. From this brief reference in Dantas’s introduction we are left in little doubt that fado music has been, or is about to be, played. The imagery of the guitarra has proven irresistible to fadologists since the concretization of the style, and much space has been given over to the history of the instrument and its possible origins, leading to often explicitly ideological positions of ownership and appropriation. 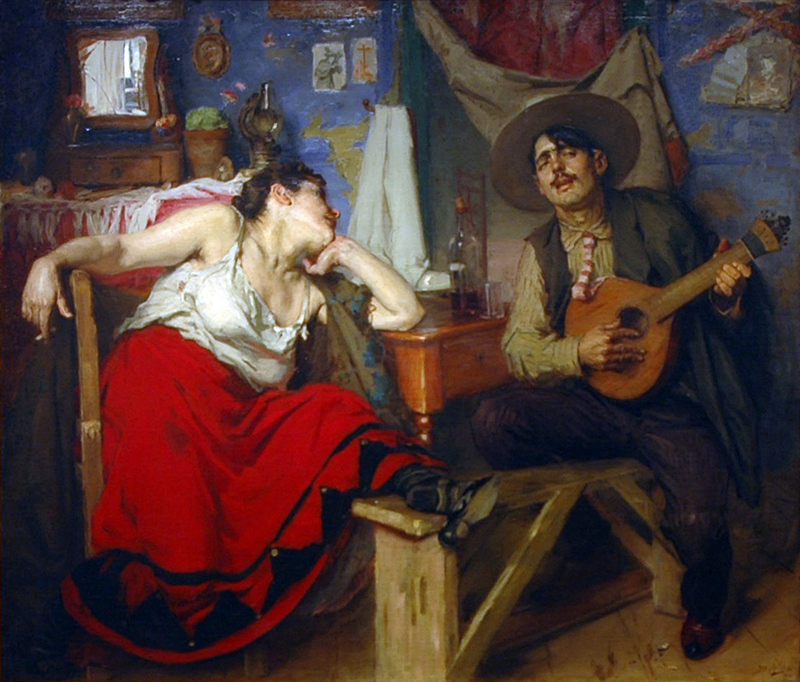 The guitarra is a central feature of José Malhoa’s much-reproduced painting O Fado, which shows a man playing the instrument while a woman leans on a table gazing at him. Many early paintings, prints and publicity photos featured women singers playing guitarras, as Severa was supposed to do, something that is not reflected in most modern fado practice, however, where women players are as unusual as female guitarists in flamenco. Malhoa’s painting was the inspiration, in its turn, for a fado recorded by Amália Rodrigues. José Galhardo’s ‘Fado Malhoa’ describes the work as ‘the most Portuguese of oil paintings’ and the guitarist as ‘a real local/a real Lisboan/a bohemian and a fadista’. In 1947, a short film was shot of Amália and the guitarrista Jaime Santos recreating Malhoa’s scene. An extract from this ‘promo video’ can be seen in the documentary The Art of Amália (Bruno de Almeida, Portugal/USA, 2000).